Budget Steve McQueen (AKA Ross Hagen, of “Sidehackers” fame) romps his way through this tour de force as an undercover agent infiltrating a motorcycle gang in the hopes of avenging his brother’s murder. And the very fact I could glean that much information by watching this movie is amazing given the complete lack of plot coherence (what am I saying? I mean complete lack of plot!) in this movie. Well, OK, I’ll come clean. I cheated – I read the back of the video box. 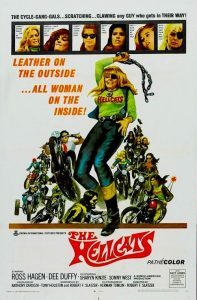 Although not as pointlessly violent and nihilistic as “Sidehackers”, “Hellcats” is a squalid film, showing the sixties in all its greasy grimy trashy squalor. This film and others like it are useful antidotes for the prevailing baby boomer nostalgia that would characterize that decade as one of peace, love, idealism, and truly selfless devotion a to great causes serving all of humanity. Let’s not kid ourselves – the sixties reeked! Just ask Budget Steve! He was there! Right, B.S.? By the way, it was interesting to see all the Coleman Francis alumni here, particularly the film’s producer, Anthony Cardoza as a hapless artist.